Open up the freshly extracted yourKayakoInstall/includes/htmlArea/plugins/ImageManager/config.inc.php and change the $IMConfig['base_dir'] and $IMConfig['base_url'] variables to reflect your setup. The other params in the config file can be changed but in most cases they’ll work out of the box. Save that file and you’re done. [php]$IMConfig[‘base_url’] = ‘http://support.company.com/images’; // no trailing slash! $IMConfig[‘base_dir’] = ‘/home/support/default_www/images’; // no trailing slash! IMPORTANT: Don’t forget to set the write permissions on the path! 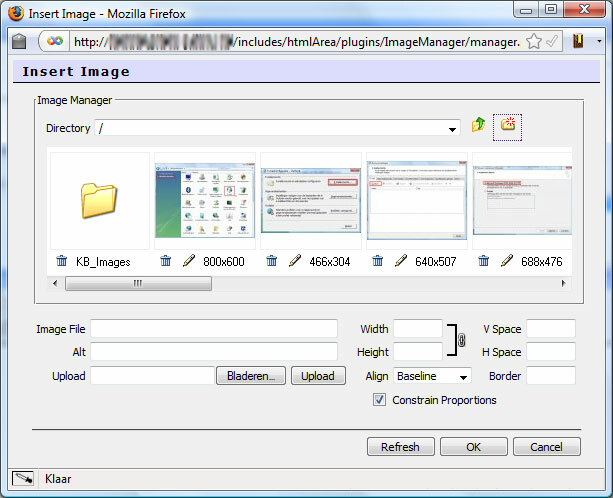 Now, when writing a KB article (for example) and with the WYSIWYG editor enabled, the functionality of the Insert Image Icon will be replaced: instead of entering an URL to an existing image, you’ll now see an image browser from where you can upload new files onto the server. Now that I have your attention: I’m quite sure the new release – whenever it comes out – will have a full XHTML overhaul, along with a spiffy new design; Just like your new website which totally rocks. The addition of some clever usage of Ajax throughout the staff and admin areas (drag and drop to sort items for example) also is on my wishlist, yet given your new website I’m quite sure you’ll manage. Does this still work on current version of esupport ?